Mutoh Belgium has introduced the new ValueJet 1638X and ValueJet 1638WX printers, the successors of its award-winning ValueJet 1638 and ValueJet 1638W dual head printers that were first introduced in 2012. The new ValueJet 1638X is ideal for use for long-term outdoor and indoor sign and display applications and can be configured with Mutoh Eco Ultra inks, as well as Universal Mild Solvent (UMS) inks. 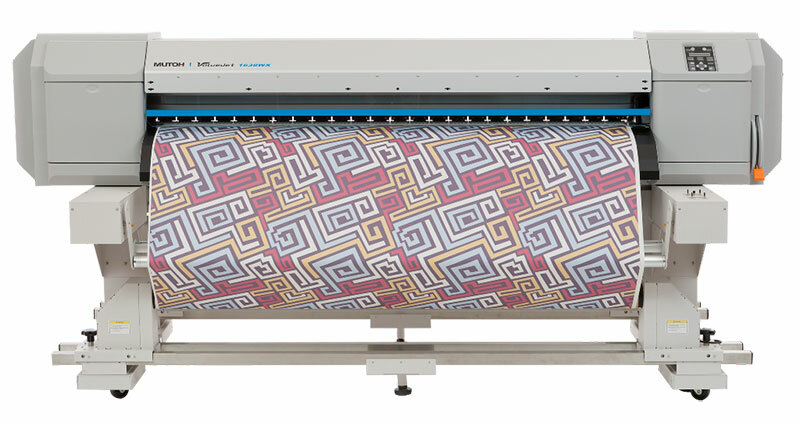 Using Mutoh’s new DS2 series dye sublimation inks, the ValueJet 1638WX model is destined for digital transfer applications, such as soft signage, apparel and gadgets. Integrating a newly developed mainboard enabling faster data communication and data processing, as well as advanced print automation features, the X-series printers are specifically targeted at volume users who, at the same time, demand constant high quality and image definition. ValueJet 1638X’s production print speeds start at 10 m²/h at 1080×1440 dpi and go up to 15, 20, 29 and 36 m²/h, the latter still at 720×720 dpi. The ValueJet 1638WX dye sub model offers production speeds of 11 m²/h at 1080×1080 dpi, 25, 42, 50 and 65 m²/h, the latter at 360x360dpi.